The most cost effective residences in Las Olas are the Hillside Condominiums. 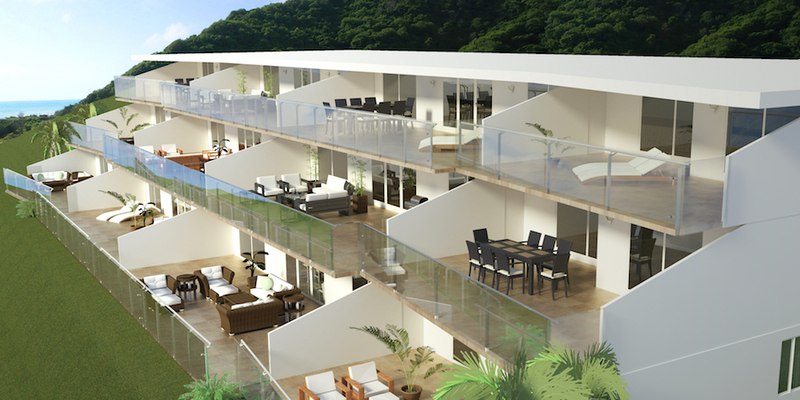 The condominiums are three story and house four individual residences per floor. Each residence averages 93 square meters (1,000 sq. ft.) and includes two bedrooms, two bathrooms, and a spacious terrace. Las Olas Ecuador has released for sale three prize locations, two of which have amazing views of both the golf course and the ocean. The property’s elevation rises on each side of the back nine of the golf course with the condominiums occupying the highest point before the cliffs. This allows the condominiums to view the golf course and ocean from above the houses located in front of them. 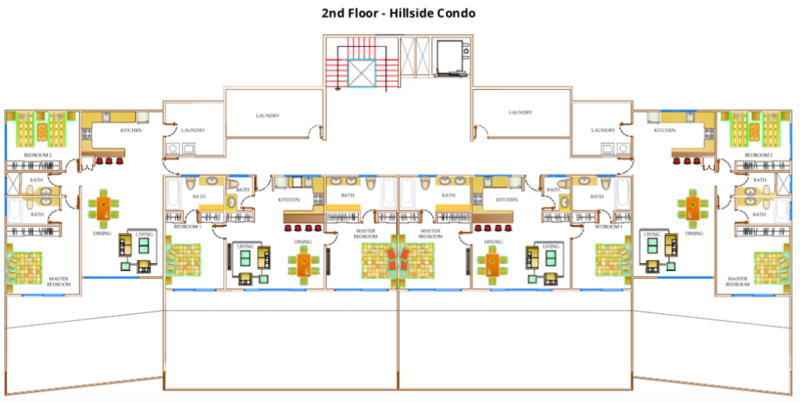 Download our floor plans for the Hillside Condo’s. 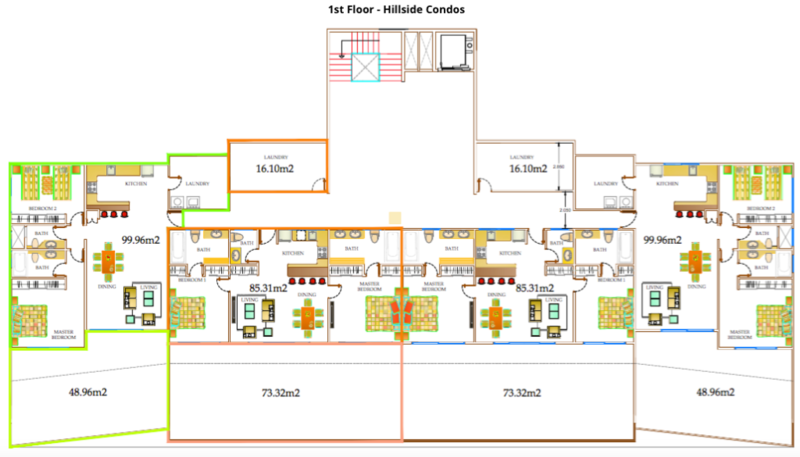 Residences 1 and 4 of the condominiums, which are located on the corners of the building, are similar in measurements. The apartment area totals 100m2 (1075ft2) and features a main room which is bigger than that of residences 2 and 3. Why not take advantage of the terrace and sip your cup of coffee on its 48,96m2 space. The biggest room in the condo is the main room with an ample space, perfect for having guests over. To the right of the entrance you have a laundry room next to the kitchen with an open space to see over the main room while you are cooking. Sitting to the left of the home is bedroom 2 and the master bedroom. The condo has two bathrooms, the master bathroom and a bathroom just outside the second bedroom. In residences 2 and 3 of the condominiums, which are located in the center of the building, are similar in measurements. These apartments are the biggest ones out of the two groups. Their area totals 85m2 (918ft2) and features a very long terrace at 73m2. The biggest room in the condo is the main room. On the right of the entrance is the kitchen with an ample space that is open to the main room and perfect for those who love to host cooking parties. These condos do not have a laundry room but have space to put your washer and dryer next to the kitchen. On the side of the terrace and in front of the entrance is bedroom 1 right next to it is the master bedroom. On the side of the entrance door are bathroom 2 and the master bathroom. These two units have a storage room right outside the hallway.